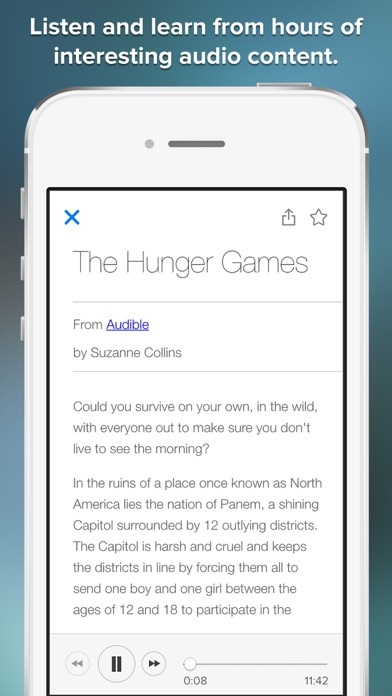 Looking for the next great audiobook? Look no further. 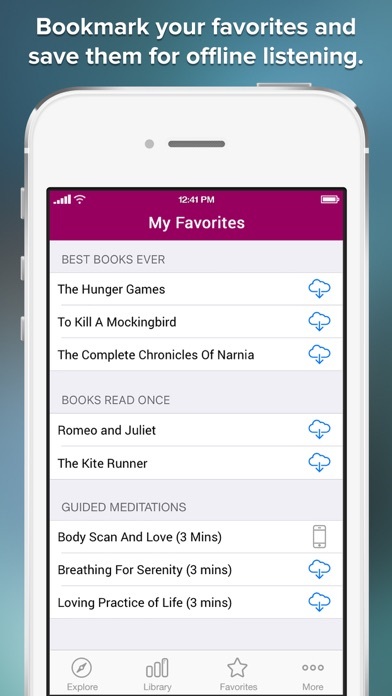 We've curated audiobook excerpts from Audible based on popular book lists from Goodreads.com. Find your your next book, then subscribe to Audible or buy it on Amazon and drift away! -------------------- BONUS: Download hundreds of other high quality audio recordings from a variety of interesting and thought provoking topics: * Guided Meditations and Relaxation Soundscapes * More Movie Reviews from Rotten Tomatoes * The Best Questions & Answers from Popular Q&A Sites * Essays from Famous Entrepreneurs and Venture Capitalists like Paul Graham * Album Reviews from Rolling Stone * Hand Picked Audiobook Excerpts from Audible * Tons of Audio Content for Sobriety and Healthy Living * Over 100 Personal Stories from the AA Grapevine * Hundreds of Curated Meditations and Spiritual Readings -------------------- NOTE: You get 5 audiobook excerpts for free. 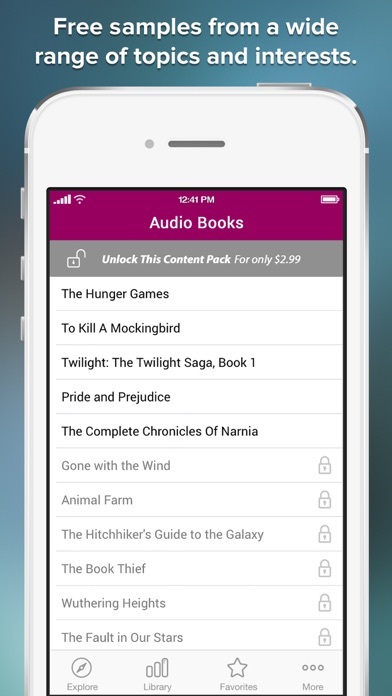 You can purchase dozens more audiobook excerpts in the app along with other great content. 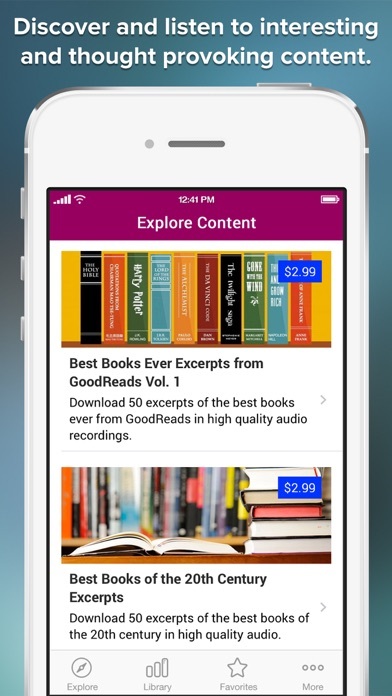 -------- This app is not affiliated in any way with Audible, Amazon or Goodreads. We have simply curated great content from great sites. 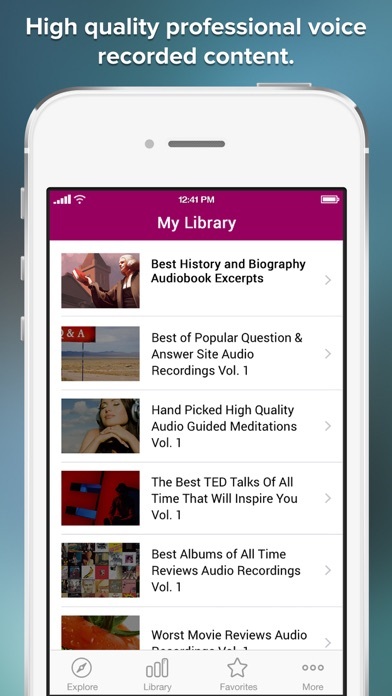 The content in this app is freely available online. You are paying for our hard work to hand curate a selection of great content and organize it in a high quality mobile app for your enjoyment and convenience.